Technological improvements throughout the 1800s simplified the process of making frozen desserts. The first hand-freezer was patented in 1848. Shortly thereafter the first wholesale ice cream manufacturing company in the U.S. was created by Jacob Fussell of Baltimore. By the turn of the century pasteurization machines and homogenizers were developed, which improved the healthfulness and texture of ice cream. The manufacturing process was simplified further with the invention of the direct expansion freezer and the continuous freezing process. Low-temperature refrigerators developed in the 1940s expanded the frozen dessert industry into new markets, leading to the creation of carry-home packages. Finally, in the late 1960s and 1970s, hightech, high-volume processing machinery allowed the industry to flourish. Dessert makers had long experimented with a variety of ice cream flavors and styles. In the 1970s, frozen yogurt’s entry into the dessert market was a distinct failure—consumers complained that it tasted too much like yogurt. Despite the initial reaction, manufacturers reformulated and refined their frozen yogurt recipes, and the increasingly health-conscious populace of the 1980s finally took to the low-calorie dessert with a vengeance. Frozen yogurt was soon available in a variety of flavors throughout the U.S. It proved to be just as versatile as ice cream, served in cones and cups, with toppings, on crepes, waffles, and banana splits. Frozen yogurt offered a tangier flavor than ice cream and more depth in flavor and texture than sherbet. Frozen yogurt gets its unique flavor from strains of Lactobacillus bulgaricus and Streptococcus thermophilous. 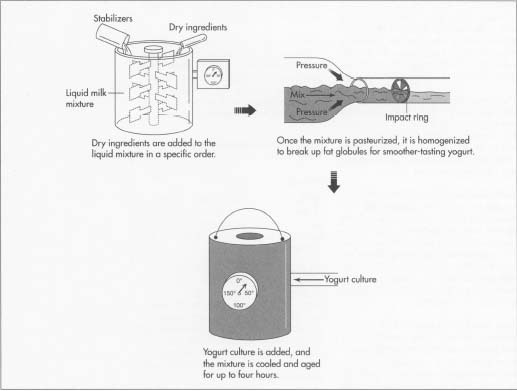 The yogurt culture includes all the strains of bacteria in the product and makes up about 1% of the ingredients. Frozen yogurt is made in much the same way as ice cream and, with the exception of yogurt culture, they are made from similar ingredients. Two of the most important elements in frozen yogurt are water and air. Air is incorporated into the mixture to add volume. Water exists in the liquid elements of the mix and is considered the continuous phase, which goes from liquid to a partially solid state. Frozen yogurt is never completely frozen; it simply contains ice crystals. The primary ingredient in frozen yogurt is milk and milk products. Milkfat generally makes up between 0.5-6% of the ingredients depending on whether the frozen yogurt is non-fat, low-fat, or regular. Milkfat lends richness to the yogurt and is the synergist for other flavorings. “Milk solids, not fat” (MSNF) makes up between 8-14% of frozen yogurt. MSNF must be balanced in inverse proportion to fat for the best body of the product. MSNF consists of about 55% milk sugar, or lactose, 37% protein, and the remaining 8% are various minerals. The protein element increases the smoothness, viscosity, and compactness of the frozen dessert and makes it more resistant to melting. Sugar makes up between 15-17% of the ingredients. Sucrose, in the form of cane or beet sugar, is generally the primary sweetener, though other sweeteners are often combined. Sugar not only adds sweetness to the yogurt but also improves the body and viscosity and increases the concentration of total solids (TS) in the product. Total solids add body and texture as well as food value, since solids take the place of water in the mixture. Egg solids may be used for solids with the added benefit of decreasing the amount of time necessary for freezing the mixture. Stabilizers, in the form of animal and vegetable gelatins, are added to the frozen yogurt so that it maintains a smooth consistency in retail outlets, where temperature changes can coarsen the texture. Stabilizers reduce crystallization, hinder melting, and improve the handling properties of the frozen yogurt. Emulsifiers are used to help blend liquids that are generally immiscible by creating smaller air cells throughout the mixture. Generally in the form of fatty acids, emulsifiers also add firmness to the body and reduce the time needed to whip the mix. Although stabilizers and emulsifiers occur naturally in milk products, small amounts are usually added, making up only 0.5-0.6% of the entire mixture. Other ingredients added in small quantities include egg solids, color, mineral salts, and caseinate derivative, such as citrates and phosphates. Additional flavors include fruit, fruit extracts, nuts, cocoa, vanilla, sugars, and spices, such as allspice, cinnamon, cloves, nutmeg, and ginger. or excess volume. The addition of air also smoothes the consistency and creates a more palatable product. In about three minutes the mix begins to freeze and within a few more minutes, the desired overrun, about 50%, is achieved. About one- to two-thirds of the water freezes during this stage. 9 After the desired overrun is reached, the mixture is packaged and placed in freezers where the freezing process continues. The temperature falls quickly, within one or two minutes, to at least 0°F (-17°C) but ideally -15°F (-26°C). For best results, the freezing process should occur rapidly so that the mixture does not form large, coarse ice crystals but small, smooth ones. The frozen yogurt may be stored in continuous or batch freezers. In the former there is a constant flow of product into the freezer, while in the batch method, batches are prepared individually. Depending on the type of freezer and the size and shape of the package, the final hardening takes between 30 minutes to 12 hours. 10 The containers of frozen yogurt are piled closely together inside the delivery trucks to minimize the temperature change during shipping. The vehicles are generally mechanically refrigerated at the same temperatures as in the storage facilities in the factory, about -15°F (-26°C), and not above the temperature at the retail outlet. Dry ice may be used as a refrigerant, though it risks heat-shock to the yogurt, which occurs if the temperature falls too low; the freezing point for dry ice is -109°F (-78°C). The frozen yogurt is shipped to retail outlets and food service establishments or to other manufacturers for further processing into novelties. All aspects of production, packaging, and distribution of the frozen yogurt should be performed with appropriate hygiene to minimize risk of contaminating the food. An automated CIP (clean-in-place) system quickly, easily, and efficiently cleans all the pumps and tanks for maximum protection against pathogenic bacteria. Manufacturers must adhere to the pasteurization temperatures and minimum times required by the Public Health Service and other regulatory agencies. Tests are regularly conducted for standard plate count of bacteria and coliform and other microorganisms, such as molds and yeast, which could contaminate the product. Also care must be taken to avoid fermentation, which could damage the product by making it more acid, altering color, and curdling. Finally, frozen yogurt manufacturers must provide accurate information regarding the ingredients and the caloric composition of the product as prescribed by law.